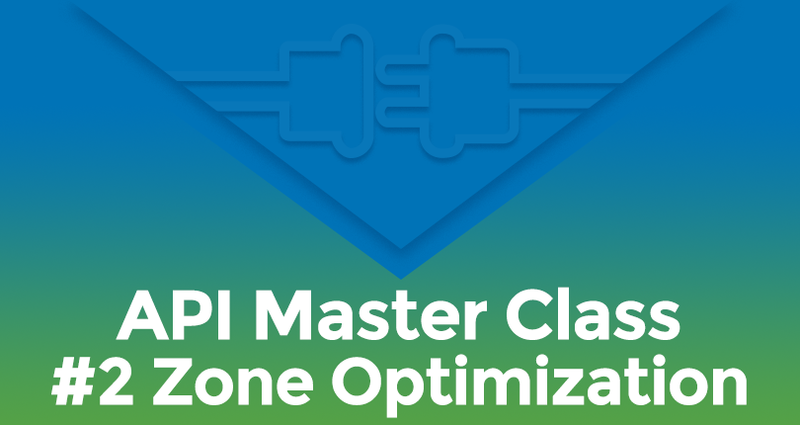 In part 2 of our 3 part API Masterclass we look at using our platform API for Zone Optimisation. 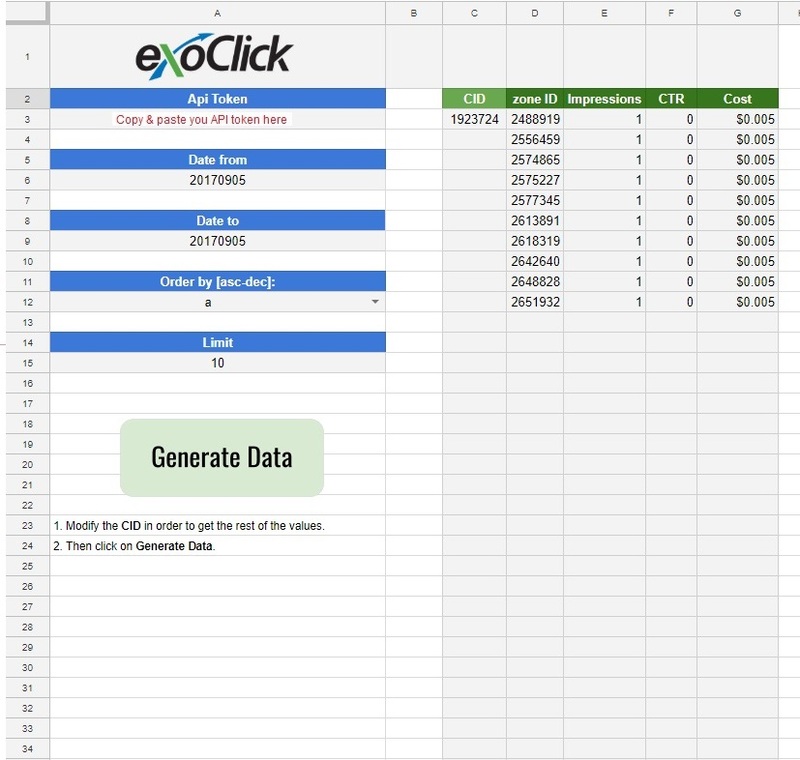 Part 1 covered Data Collection (click here) The aim is for you as an advertiser to use our examples to help get you started using the API and then later, when you feel more confident you can start creating your own examples and tasks. Zone Optimization allows you to filter your spend for each zone id and then block those zones that are not performing. The purpose is to help you see how your top 10 zones are performing in order to optimise your campaign. Or analyse the bottom 10 zones so you can block under performing zones. This way you can see which of those zones are more profitable for your campaign. Copy this spreadsheet to your Google Drive and then open it. All of the API coding is done using Google script language, so when you open the spreadsheet simply go to the Tools menu and select Script Editor. Copy and paste your API token as marked in the diagram below. Here you will see that on the left hand side (green) you can fetch a campaigns data for impressions, CTR and cost: filtered by zone. On the right hand side (red) you can see the section for blocking zones. Additionally, you can select how many zones you wish to pull data from and display by inserting a number value in the Limit field, the spreadsheet says 10 for 10 zones but you can change this value for however many zones you wish to get data from. Copy the zones that the API has selected then paste which zones from that list that you want to block in the zone ID to block field. Select from the drop down menu under Network Selection and select: All or RON or Premium or Members area. Then select from the drop down menu under Partner Networks select: enabled or disabled. 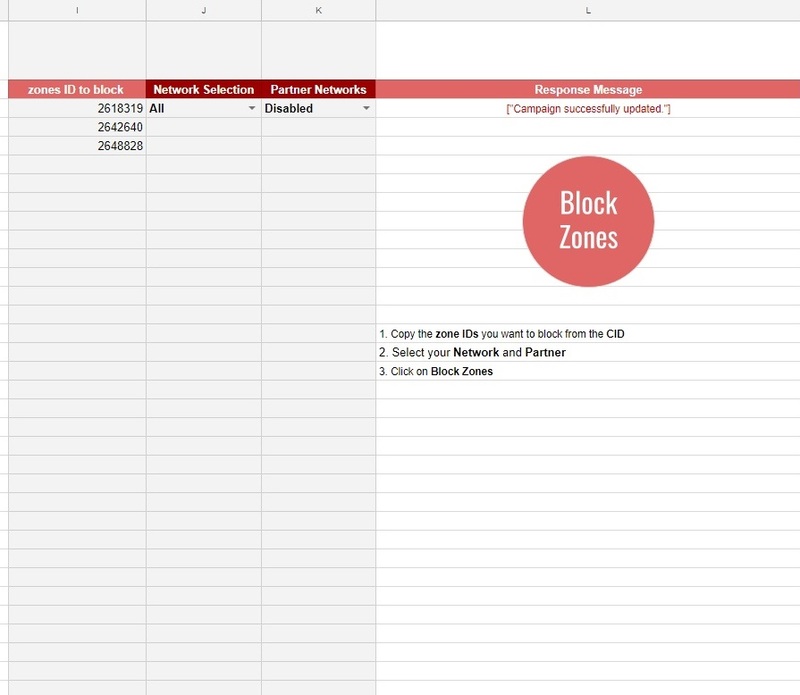 Now you can block the zones from the CID you have used on the spreadsheet by simply clicking on the Block Zones button. If everything is correct the message ‘Campaign successfully updated’ will appear under Response Message. Please note: Some zones will be just available on specific Network Selections, therefore after pressing the Block Zones button and you receive an error message you should check the network selection of that zone. And that’s it! Practice with a number of different campaigns and use the insights generated from your data to help you make the right optimisation decisions for targeting and blocking ad zones.